Overall we are quite bullish on this ICO, but we are unable to rate this ICO at the moment. There are questions about the development roadmap, use of proceeds and vesting schedule that need to be answered before we can provide a score. ICO got cancelled as all the funds where funded during the presale! Founded in 2014 at Harvard University, with offices in the USA as well as in India, Nucleus Vision is an IoT ‘Internet of Things’ based, contactless identification system that empowers retailers to identify and better serve their customers. Their solution captures and provides previously un-accessed data to retailers and other businesses through its proprietary blockchain and real time sensor technology that can uniquely identify users and detects temperature, pressure, motion, acceleration, and sound within its vicinity. Nucleus has developed a sensor that can identify any customer in a physical store without Bluetooth, Wi-Fi or GPS protocols, and is completely seamless and frictionless. Their IoT sensor technology is able to detect mobile phones as they pass through storefronts or any other location where a sensor is set up, enabling stores to detect visitor phones and mobile ID data privately over blockchain. This solution provides insights into customer behavior that were not previously possible, such as the ability to track customer visits, to paths taken in-store, favorite products and brands, and predict future customer behavior in-store. What problems are Nucleus Vision trying to solve? Giant corporations around the globe have traditionally monetized their customer data solely for their own benefit, and have maintained exclusive control over said data. Nucleus Vision shifts the power of data monetization to the customers themselves, enabling them to take full control of their own data, and the power to monetize it. This is decentralization in its truest and strongest form. Imagine shopping and having the store know exactly what you like and what you might be after. They approach you (digitally through your smartphone after identifying you using Nucleus Vision’s ION proprietary IoT sensor) and politely ask if they can help you. It’s your decision if you share your data via Nucleus Vision. By sharing your data you can earn nCash which can be redeemed with any of Nucleus Vision’s partners. What is product is Nucleus offering? ‘Nucleus Vision’s proprietary sensor network, the ION Network, can uniquely identify and sense temperature, pressure, motion, acceleration and sound within the vicinity of the sensor. The sensor is plug and play, includes remote management, is technology agnostic, there is no dependency on app, Bluetooth, Wifi, RFID or facial recognition. It sends information transmissions securely over the Nucleus Orbit Blockchain’. ‘Nucleus Vision’s blockchain platform, Orbit, is the foundation over which customer identities, customer data and the nCash tokens flow accurately and securely between all involved parties and systems’. ‘The Nucleus Vision Neuron intelligence platform is state-of-the-art analytics engine that leverages the strength of deep learning, blockchain and IoT. The Neuron platform enables retailers to take advantage of time and opportunity when customers are most receptive. Neuron connects retailers and customers at precisely the right moment to bring an element of delight and surprise to the retailer’s customer service regime’. ‘nCash is the decentralized cryptocurrency of the Nucleus Vision ecosystem, which is used for various transactions across Nucleus Vision. nCash serves two primary purposes: 1) it is the backbone of the Nucleus Vision Universal Loyalty Program (retailer rewards system), and 2) it is a currency used to enable the transfer of data from one party to another. Retailers in the Nucleus Vision network can reward their users with offers using the nCash, which can be redeemed across any retailer in the Nucleus Vision network. nCash is a non-mineable ERC20 Ethereum token with a supply cap of 10 billion nCash tokens’. The glue that makes all these components work together is called BASICST2S4. This is is a proprietary twelve layer technology stack, developed over the past three years by the Nucleus Vision team. I am not going to go into detail about the inner workings of this technology stack, because it is quite technical and that is not the aim of this paper. What benefits does their product offer to retailers and customers? Past Experience: Director of Sales and Marketing at Levi Straus & Co, VP Sales C-Tribe, National Sales Director Petrol Jeans, Vice president Sales Boom Financial, VP Sales Knockopp etc. How are Nucleus Vision’s token used? 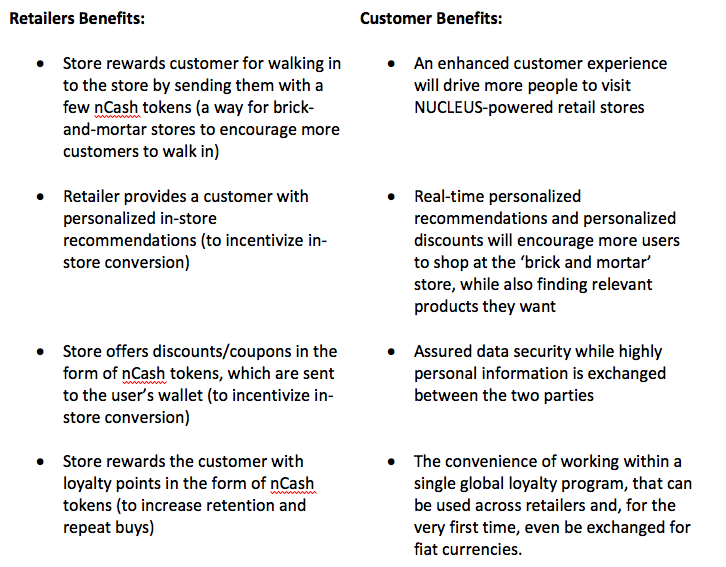 When the customer walks into a retail store, the retailer rewards the customer for visiting their store, the retailer credits Ncash tokens to the customers Ncash wallet. When the customer makes a puchase at the retail counter, they receive loyalty points in the form of Ncash tokens for that purchase. Tokens can be used to purchase goods at a discount at Nucleus Vision’s affiliated stores. Huge market: Retail sales account for $ 28 Trillion turnover worldwide but it suffers from increasing competition from online stores. This is caused due to convenience and decreased incentives for people to shop in retail stores. Nucleus aims to solve customer experience with tailor made loyalty programs. A small portion of the market captured by Nucleus Vision would be an exponential increase in the capitalization of this project. Working Product: The Nucleus team already has a working product collecting live data from 10 stores in India as a pilot project. Team/Investors/Partnerships: Nucleus Vision has a strong team that is rewarded with the trust of prominent investors and investment funds. This is a sign that the big players have confidence in both the project and the team. Nucleus also has partnerships with leading telcos such as Vodafone and Reliance Communication. For the design of their sensor technology they work together with Chip Manufacturer Intel. Besides having the backing of top investors like Tim Draper, Nucleus also has sound mentorship from their advisers. Their advisors hold lead positions in their respective fields and includes Venture Capitalists as well as professors from Harvard Business School and others. Confidence from International Brands: There are more than 100 well-known brands that have expressed their confidence in Nucleus VIsion .. including Tommy Hilfiger, Lee, Gap and many others..
Community: Every succesfull project needs a big community that plays a major role in the success and impact of the project. Nucleus Vision already has an active following of over 25.000 users. This shows that there is a tremendous interest in this project… so big.. that they had to close their whitelist registration prematurely. No Whitepaper yet: There is no whitepaper available yet that explains into detail how their product works, howmuch it would cost for the retailer to install it and what the technical specifications are of the sensor, their Orbit Blockchain and other services they offer. Untill we receive the whitepaper, we cannot make any judgement about their product. Their Lead Blockchain developer does not have any blockchain expierence: Their lead blockchain developer, Bryan Lemster, does not have any demonstrable blockchain experience. His past experience is with SAP and ERP systems as well as the development of Apps but he is not related to any blockchain project. Dependency on Telcos: In order for their product to be successful, they depend on cooperation with telcos. Telcos are known for the fact that it is difficult to cooperate with them. Every country has different Telcos and for evey country they would need to negociate new agreements. Customer adoption: This project depends on retail companies to implement their solution and on consumers who are willing to share their information, this project depends on Nucleus Vision’s ability to recruit these customers. We would like to see more information about their route to market. (which was promised to us in the near future). Overall we are quite bullish on this ICO, but we are unable to rate this ICO at the moment. There are questions about the development roadmap, use of proceeds and vesting schedule that need to be awnsered before we can provide a score. We addressed these issues with Nucleus Vision and they promised us a response, as soon as we have all the required information, we will update this video presentation. Unfortunately the ICO got cancelled, during the presale they got already 100% funded! Distributed in ICO ICO got cancelled, everything sold in Presale!